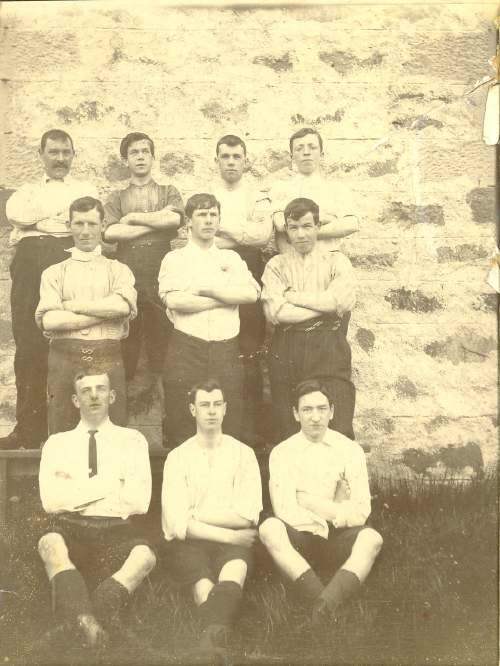 Black and white photo of Dornoch footballers. Back l to r: Angie Munro (gardener), Sutherlands (Gruids), Jim Leslie (Embo St), R Grant (Captain). Middle l to r: Jim Mackay (Tornaver), WH Innes (painter), Bob Murray (chemist). Front l to r: J Macintosh (Embo Farm), A Gillespie (paper shop), Walty Matheson (golfer, killed in France). Photo was in a tatty grey mount which has been discarded (Oct 30 2006). Also enlarged copy mounted on foam board. I don't think there was a Jim Leslie at Embo St in 1900. It could have been John "Jock" Leslie from Embo St who later had a plumbers business in Dornoch.